Jesus got into the boat and crossed Lake Galilee. Then as he stood on the shore, a large crowd gathered around him. The person in charge of the Jewish meeting place was also there. His name was Jairus, and when he saw Jesus, he went over to him. so she will get well and live." Jesus went with Jairus. Many people followed along and kept crowding around. A little while later, some men came from Jairus' home and said, "Your daughter has died! Why bother the teacher anymore?" "Don't worry. Just have faith!" "Why are you crying and carrying on like this? The child is not dead. She is just asleep." "Talitha, koum!" which means, "Little girl, get up!" The girl got right up and started walking around. Everyone was greatly surprised. But Jesus ordered them not to tell anyone what had happened. Then he said, "Give her something to eat." What a great day it was today as we bring an end to Term 2. We celebrated Lenihan Day and reflected on Monsignor Lenihan and the work he completed in Northam, especially in his role in bringing the Marist Brothers here to start St Paul’s College. 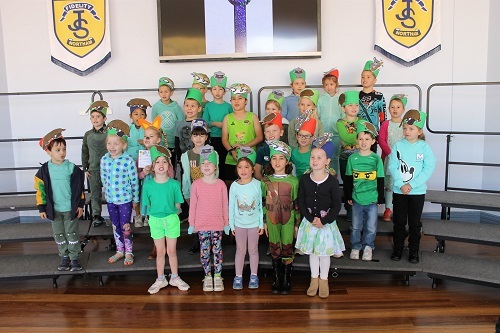 Our Year 1 Gold class prepared our Primary Assembly and our Secondary Lenihan students ran the Assembly on their campus. We thank the students and staff for their hard work in the preparation of these events. 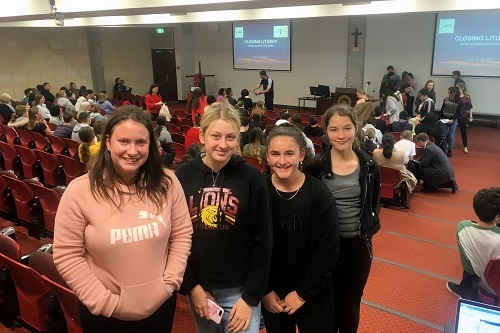 On Monday, four of our students Michaela Sandrini, Brooke Dymnicki, Shayla Dunstan and Demi O’Driscoll attended the Catholic Youth Festival at the University of Notre Dame. The Catholic Youth Summit targets students in Years 10 and 11 providing a forum for students to network, learn about Catholic leadership and share their hopes and concerns. Thank you to Mr Reidy for accompanying our students. Well done to all students on their participation. The top 2 finishers in each year group will now be invited to participate in the Meckering Cross Country in Term 3. 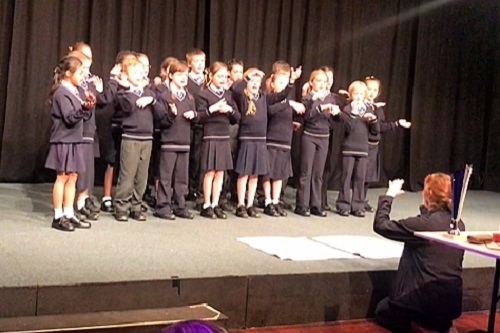 Today our Primary Choir entered the Northam Performing Arts Festival. It was a pleasure and with great pride that I was able to hear them perform. They sounded marvellous! Well done to the Choir and Mr Reidy for their fine performance. Throughout this week, our students have been entering the various Festival categories and I am hearing that they are enjoying the performances and doing very well. We congratulate our Year 4 students, under the guidance of Mrs Parker, who received an Outstanding for their Drama Presentation of the Story of Christopher Columbus. We congratulate our students for their great enthusiasm and participation in this event. Our staff have worked hard to complete Semester Reports and these were posted early this week. Secondary students will also be able to access results through SEQTA. With your Reports, you will find information regarding the Parent/Student/Teacher interviews scheduled for 26 July and 2 August. Parents and Caregivers are encouraged to meet with your child’s teachers to discuss progress or any concerns. As these evenings fill quickly, you are encouraged to return your forms as soon as possible so that you manage to get your preferred times. 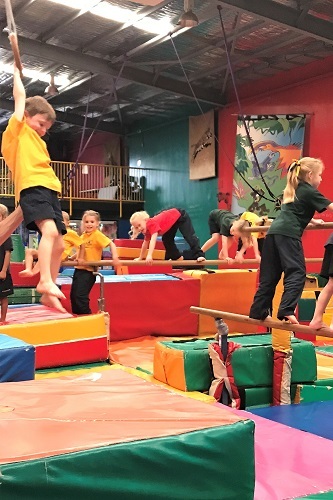 Enrolment interviews for Pre-Kindy and Kindergarten 2019 have commenced. If you or your friends are interested in securing a position for a child, please bring your completed Enrolment Application form to our Primary Office as soon as possible. Interviews for vacancies in other year groups will commence next term, however, we encourage families to complete Enrolment Applications sooner rather than later. We congratulate Nathan O’Driscoll (Year 11) who has been selected for the NAB AFL Under 16 Championships State Team. 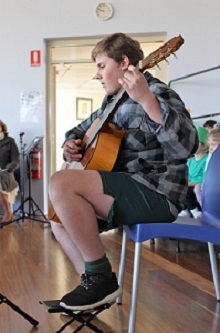 He played in Adelaide earlier this week and will be playing in Queensland during the school holidays. We wish Nathan every success as he competes in this year’s program. Well done, Nathan. As we end our term we farewell Mrs Verity Chomiak and Ms Denise Bath as they conclude their time with us. We wish Mrs Rhonda Oliver a relaxing and adventurous long service leave. Ms Sophie McDonald will be on leave for four weeks and I, myself, will be on long service leave for two weeks. Should the need arise, Mrs Rebecca Clarke will be able to assist you in my absence. I wish you all a wonderful time with your family during the next two weeks break. School resumes for students and staff on Monday 16 July. 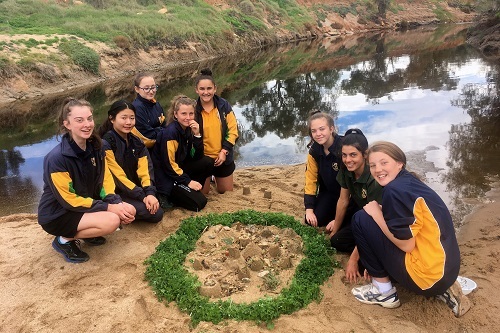 The Year 10 cohort attended their Retreat Day on Tuesday 26 June. The day encompassed a great deal of personal and group prayer and reflection. Students enjoyed their day, especially the aspect of imagining themselves walking the shores of Lake Galilee. 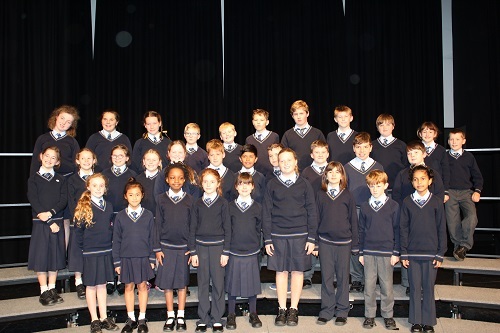 Congratulations to all of our students who participated in the Northam Performing Arts Festival. Well done to Mr Reidy and the Primary Choir for a fantastic performance today. The depth of talent we have at our School is truly amazing. 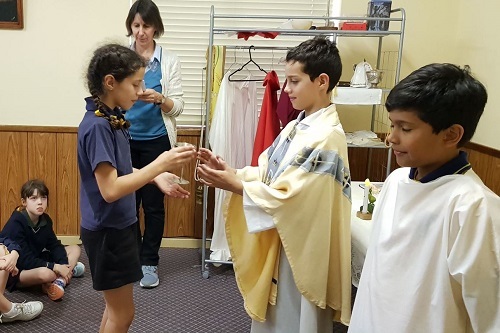 On Tuesday 26 June, our Year 4 students visited the Schoenstatt Shrine in Armadale to participate in the First Communion Retreat as part of their Religious Education program. 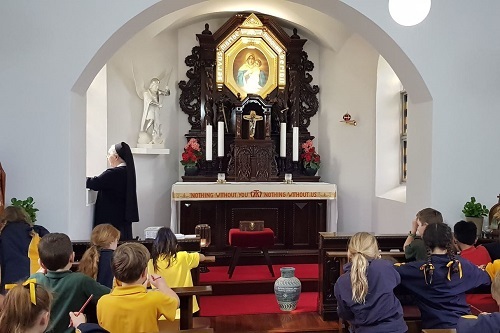 Sr Lisette conducted the Retreat, providing the students with various faith-filled sessions which will help them in their preparation to receive Jesus in Holy Communion later this year. 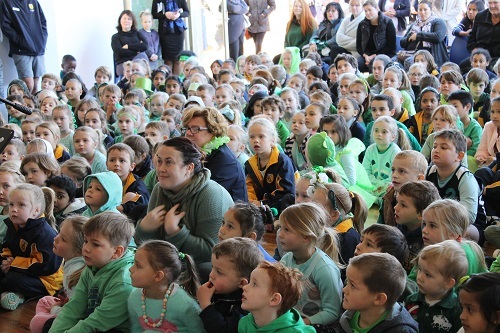 Thank you to all the staff, parents and students for a wonderful Term 2. As the term draws to a finish, I wish everyone a relaxing holiday and look forward to seeing everyone return safely for another term starting on Monday 16 July. 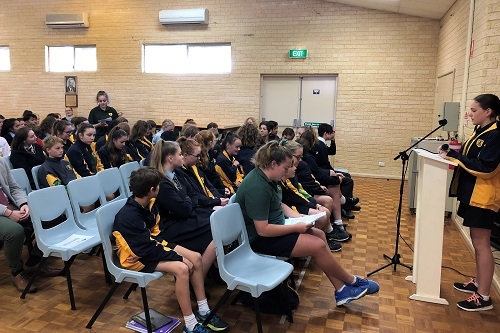 The Northam RSL Sub Branch would like to invite a senior Secondary student to speak at the local Remembrance Day Service in November this year. Any interested students should speak with Mrs Parnham to register their interest. The speech could include personal anecdotes from family members who may have served, a poem, or even a letter written to a loved one during the war years. It could also be a speech on "What Remembrance Day Means to You?" Entries are to be submitted to Mrs Parnham by Friday 17 August [Term 3 Week 5]. This term in Kindergarten, the students have been exploring water, wet weather clothing, oceans, sea creatures and much more. 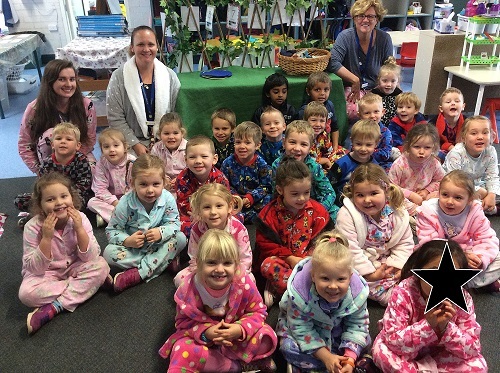 On Wednesday this week, the Kindergarten students came to School in their pyjamas to celebrate the end of the school term. 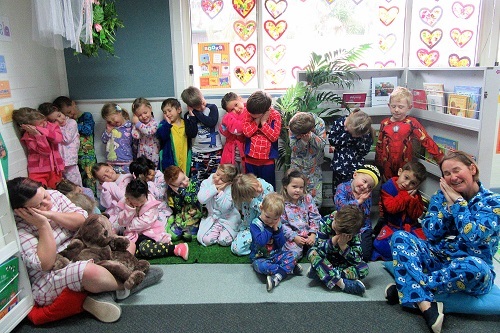 The experience linked their learning by wearing warm pyjamas on a cold, rainy day and watching the movie 'Finding Nemo' which also linked to the students' learning of coral reefs and sea creatures. 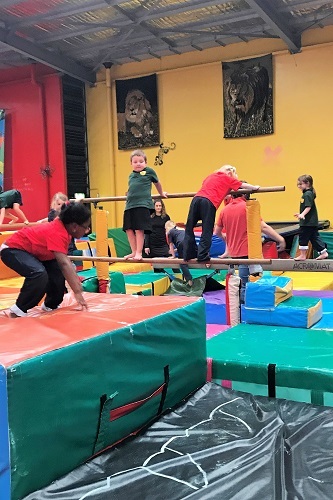 On Friday 22 June the Pre-Primary students went on their first big excursion to Jungle Gym in Willetton. After the excitement of the bus trip, we arrived to see the giant gym equipment. We had a quick lunch and then it was time for our gymnastics circuit class. Everyone had a great time practicing the skills we have learnt in our morning Perceptual Motor Program lessons. 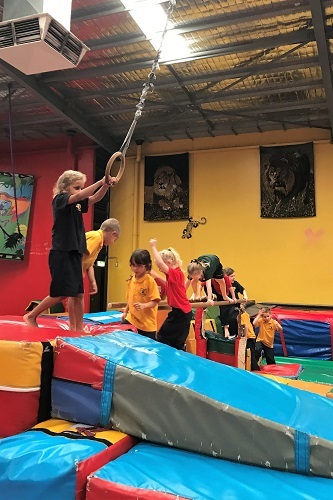 We swung on ropes like Tarzan, balanced on balance beams, did forward rolls down gym mats and jumped into giant foam pits. We finished our session with some free play to practice on our favourite pieces of gym equipment. Thank you to all the Mums and Dads who joined us for the day and helped us develop our gymnastics skills. On Tuesday 19 June, the Year 6 students attended the exhibition in York, 'Remembering York's ANZACS'. Students relished hearing the stories of ANZACs who fought in World War I, their struggles, their victories and at times, their suffering. The York Town Hall was filled with the silhouettes and photos of 100 soldiers to mark the 100 years since the end of World War I. Objects of interest included a Turkish soldier's uniform, the replicas of the trenches and dug-outs, the sound effects of gunfire, a replica 4kg rifle and some of the post-war prosthetics and aids for returned soldiers. The students were interested and enthusiastic about the displays. At lunch, students enjoyed having some fresh air at the park by the river and thoroughly enjoyed scaring Mrs Parker on the swinging bridge! Students also visited the York Residency Museum, which has an immense array of objects from early settlement in York. There was collections of old farming equipment, cooking equipment, stories of Aboriginal families and of migrants. 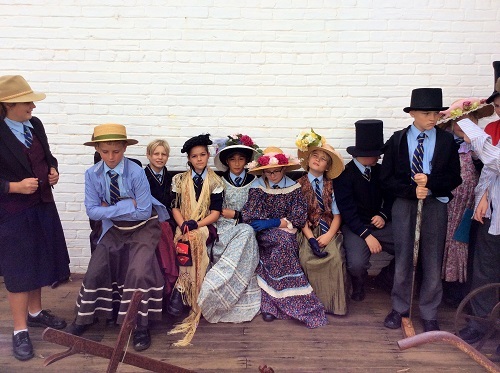 However, the highlight seemed to be the pioneer costume dress-ups! Students completed their visit to the museum with croquet and quoits on the front lawn. The day was enjoyed by all and gave students a great start to their history topic for HASS next term. 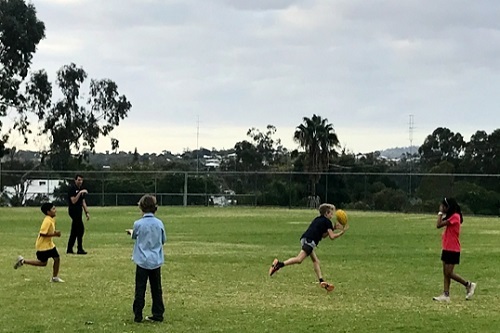 Thank you to all involved in another successful term of Sporting Schools Program at St Joseph’s Primary campus! 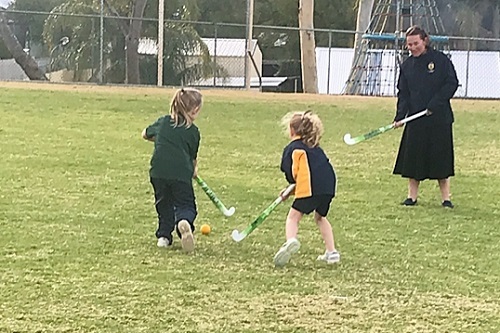 AFL and Hockey were both well received by the children this term. Thank you to Mr Hewitt and Mrs Trenorden for their help with coaching. Once again, Hockey has proven to be a very popular choice for Term 3 and unfortunately I am unable to accommodate everyone. I look forward to seeing the students back next term, ready and eager to learn some new skills. 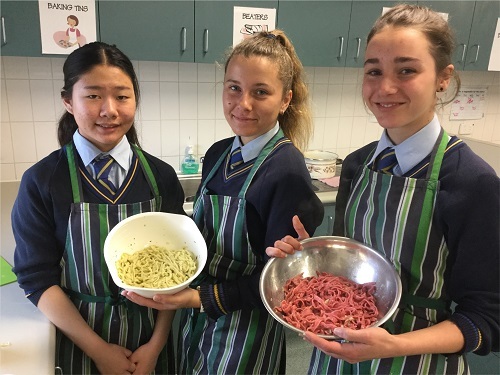 This week, the Year 10 Food Class improved on their pasta making skills by making flavoured pasta. We had some beautifully coloured pasta and some interesting flavours! There was roasted red capsicum, pink beetroot, yellow curry, orange sweet potato, herby green and a white garlic. Bon appetit! 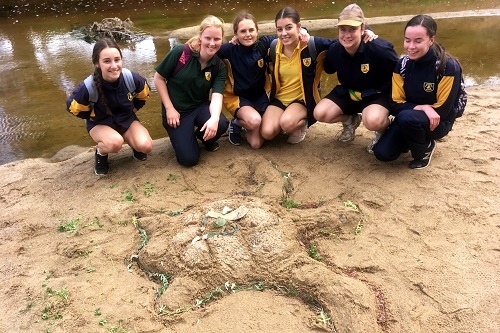 This week, 24 students from the Secondary da Vinci Club participated in the Australian Society of Medical Research Quiz. This is an online national competition that tests the skill and knowledge of students in areas relating to medicine, health, diseases and disease control, immunology and treatment practices. There are a range of certificates and prizes on offer to participants and we look forward to receiving the results returned early next term. We remind parents and caregivers that our next meeting will be held in Week 1 of Term 3, Thursday 19 July at 1.30pm in the St Marcellin Performing Arts Centre. We look forward to seeing you there. During the coming July school holidays, there will be a wide selection of activities for school-aged children to join in. Activities will be held at Northam PCYC and the Rec Centre each week. On Monday 2 July, a Floorball activity will be conducted with Australian Team representatives [local students] and a Robotics session for 8 to 12 year olds on Tuesday 3 July at the Northam Library. Food and water will be provided at all sessions and parents/caregivers are most welcome to stay and assist. Several of sessions have limited space so early registration will be required to secure a spot. To register, please email northampcyc@wapcyc.com.au or call the Northam Rec Centre on 9622 2220. The last of several events being held during June to fundraise for the Perth Childrens’ Hospital will take place on Saturday 30 June with a Bingo Night to be held at the Northam Workers’ Club commencing at 6.30pm sharp. Tickets are $5 each. There are some fantastic Bingo prizes and a Door prize. Bar available and BYO food/snacks. Tickets available from Northam Workers’ Club or Triple M Radio Station, Fitzgerald Street, Northam [opposite Red Rooster]. The Northam Netball Association will be running their NetSetGo Skills program in Term 3 for 8 weeks commencing on Monday 16 July through to Monday 3 September. The sessions will be held at the Northam Rec Centre on Court 1 between 4.30-5.30pm. Cost is $60 per child and is open to all five and six year olds (born 2012-2013) and any 7 to 8 year olds not already playing and wishing to join in. Registration must be done online. Find the link on our website, under NetSetGo Skills 5-6 Yrs http://northam.wa.netball.com.au For further details, please email us at northamnetball@gmail.com or check out the information on our website. The Northam Dental Therapy Centre wish to advise of their new opening hours. These are 8.00am to 4.00pm Monday to Friday. We are currently servicing Northam, Wundowie and Bakers Hill and are located at Northam Primary School, Duke Street, Northam. If you are concerned about your child’s teeth, please feel welcome to contact us during business hours. Phone (08) 9622 2385 or email NorthamDTC@dental.health.wa.gov.au A/H emergency phone 1800 098 818 between 6:30pm and 8.00am seven days a week. 4 encourage children by setting a good example and use positive reinforcement to make the activity fun. We have brushing charts and games/activities you can ask for in the Clinic if you are finding it hard to encourage young children to brush. The Uniform Shop will be open for families to access on Friday 13 July between 9.00am to 11.00am. The Shop will be open for normal trading hours in Week 1 of Term 3. I would like to thank all our volunteers for your assistance and support during Term 2 and look forward to seeing some of you again next term! Please remember that any assistance is always appreciated, even if all you have is an hour or two one morning, you are very welcome to contact me to go on the Roster.